Mr McEwen Chairman of IES Schools, Director of Music from Cramwell and his wife and housemasters/musicians from Oakham School. They were all impressed by the performance. 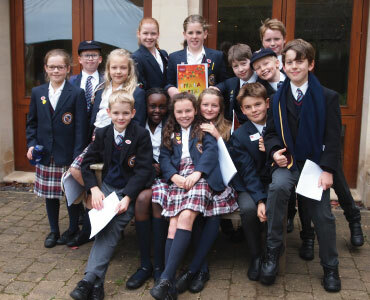 An Opera, written and performed by our very own Junior children. All played their role magnificently. The characters of Edith Cavell, Hedd Wyn and Phillipe, remind us about compassion and selfless dedication to others whatever the personal cost. A brilliant performance and meaningful message for us all. Congratulations to all involved in the production. With less than a week to go now, excitement and nerves are mounting amongst the juniors as they prepare for their very first opera. Children from all classes have been hard at work in rehearsals, while the final touches are being put to costumes and sets. The publicity team has been busy receiving replies to their press releases and VIP invitations. Alas, Blue Peter can’t make it, but Mrs Kennedy has been interviewed in Welsh for BBC Radio Cymru, and written a Welsh blog for them too. We took some publicity photos for them, featuring some of our key characters. We hope you have bought your tickets, but there are a few still left if you haven’t – see Mrs Nesbitt to book your seat for our world premiere, and make sure you have plenty of tissues as we hope it will truly stir the emotions! This week Class Six have been casting their attention onto promotional activities, and were lucky enough to meet Jo Townsend, Art Director for Purr Creative. She brought in samples of advertising and promotion that she has created for companies such as The Cartoon Network, and encouraged the class to think about the key images and ideas that could represent their opera visually. A great deal of discussion was had about the name of the opera, which has finally been confirmed as “World At War”. Now the children are going to go away and come up with images, colour, moodboards, designs and press release copy that we can share after the half term holiday. A big thank you to Mrs Joy for organising the visit. Set Designers get to work – While our work on the melodies for our opera continues apace (Year 5 have now started composing their songs(, it was time for some more work on the design elements this week. Year 6 divided into four groups to each create a key scene for our production; “The Station”, “The Battlefield”, “The Hospital” and “The Dream of Hedd Wyn”. The results are very impressive and are currently on display in Year 6. They will certainly help inform our designs for the real set. We had a very productive afternoon of composing this week. Class Six worked in groups to put music to their lyrics in five key scenes. We haven’t finished yet, but it was a great start, helped in no small part by our volunteer musicians, Kate Landy and Henry Scott. Kate, a former Grantham Prep pupil, and Henry are studying A Level Music at the Grantham Grammar Schools. They are going to support Mrs Banfield in helping the children transfer their ideas to notation, and then helping them orchestrate the opera. Henry is hoping to study composition at university next year, while Kate’s ambition lie on the stage, so she will, no doubt, be able to help with acting and singing tips for our performers. I was quite sure when we started our Opera project in September that we would gain a lot from it, but it has already proven to be so much more of an experience, and involves so many more ares of learning that even I anticipated. Since the start of term we have travelled to London to watch an opera – obviously gaining wonderful music experience but also learning the social skills of travelling and theatre-going, and discovering an enormous amount about our capital city. Back at school we have been busily writing our librettos, clearly honing English skills, but also learning to work as a team – collaborating, listening to each other’s opinions and sometimes giving way gracefully. Today, the project unexpectedly took us into the realms of science. Class Six were privileged to be given a backstage lesson at the Guildhall Theatre, Grantham by the theatre’s technical team, and as well as learning about the vital role of lighting, and the different uses of curtains (honestly!) they were taught about the power and danger of electricity, learning about the high wattage and current needed to operate a theatre, and comparing it to the familiar power of household electricity and AA batteries. Some have even gone away determined to experiment with the viscosity of various store cupboard ingredients in order to create the perfect stage blood for those allergic to peanuts! The enthusiasm amongst Class 5 and 6 is as inspiring as ever and I am so impressed by the sensible but engaged way they approach every task and opportunity. The children made the most of their theatre visit, preparing very intelligent questions clearly focussed on helping them design sets and using the stage to its maximum potential. They discovered that they can use the orchestra pit and will be able to operate the follow spots and lighting desk themselves – what a thought! We have all come away with a tremendous amout to think about, and a huge feeling of gratitude to Pikey and Laura for giving us two hours of their very busy time. This week Class Five have been completing their characterisations, while Class Six have started to plot out the scenes for the Edith Cavell storyline. They have been working out when to use arias as opposed to recitative; what sort of ensemble singing is needed and how best to use the chorus. Their ideas are genuinely impressive, as it their enthusiasm. As well as tragedy, they have decided to bring in some romance – I wasn’t expecting that! Characterisation is the focus for our Opera Company at the moment, Class Six are now well underway with the development of the characters of Edith Cavell, Phillipe Baucq, The Collaborator and the German Officer. They have created life size posters on which they write and draw their ideas, including adjectives to describe the character;colours, texture and animals that symbolise them; their status in life and habitual sounds and movements that they make. Some excellent ideas have included the description of the Officer as “misanthropic”;midnight blue silk for Edith and the choice of a snake to represent the callaborator. Class Five have also made a start on their characters and will be taking their ideas further next week. After Class 5 forged the way two weeks ago, writing their rather beautiful and poignanat “Six Point Plot” and outlining characters for the tale of Hedd Wyn, Poetry Club and Class Six have risen to the challenge and had a really productive period. Poetry Club have created two very detailed characters – “The Hero” and “The Daughter of the Storm” and written the outline melodic themes for our opera! Class Six meanwhile have pressed ahead with the storyline for their section about Edith Cavell, with a dramatic and (not to be outdone by Class 5) tragic plot. With the boys busy playing at a football tournament, the girls brainstormed words to describe the betrayal of Cavell by a collaborator, then created some amazing mood boards. When the boys returned the next day they were able to explain in greater detail what the various elements on their boards represented, for example: olace symbolising hidden secrets; red for the anger caused by betrayal; tinsel shreds to represent the sharp spikes which wound in betrayal; deep blue crepe showing the strength of character of the Belgians who helped Cavell; silver mesh for her imprisionment. Entitley their own ideas – my only input was in emptying my cupboard and letting them help themselves to rags, paper, tinsel etc. Their thorough processes, creativity and teamwork were extremely impressive. The whole class then worked on tableaux of the moment of arrest, taking on the various characters of the collaborator, Cavell, her helpers, injured soldiers, German officers and men. The children worked together brilliantly and really brought the emotional heart of the story to life in these frozen moments, using posture, gesture and expression to make it abundantly clear which role each played. I have been delighted by the enthusiastic and committed approach the children have taken and I am looking forward to our next steps. We will keep you update on our progress. Our “Write an Opera” teams in Class 5 and Class 6 are busy learning about song structures, the themes for their section of the opera, and have been gathering inspiration for design, and the time has come to ask for a little help. Nothing too difficult yet! We would desperately like old samples of fabrics, wrapping paper, brown paper, foil, string etc. To help us create character layouts and, after half term, to start thinking about set boxes. The Poetry club and I have already started work on character layouts for the mystic story of “The Hero and The Daughter of the Storms” – please ask Class 5 to explain. In the meantime, all donations gratefully received. Thank you. As many of you will know, I was lucky enough to attend a Royal Opera House course this summer called “Write an Opera”. It was an incredibly inspirational experience; five full days (from early morning till 9.30pm) of art, design, music, singing, acting, composing and lighting. By the end, the group of 20 Teachers from around the world had completed and performed their own mini-opera and come away with the ideas and format to teach our own children to do the same. So now it is over to us. Here at Grantham Prep. 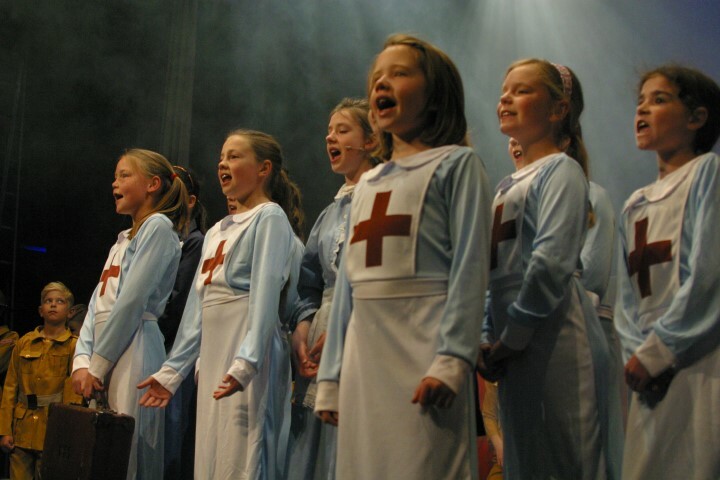 the project will involve all the Juniors to some extent, as our opera will become our summer show in 2015. The children will all either perform as singers or musicians. The writing of the libretto and score will be a project for classes 5 and 6 and this will be carried out primarily in music lessons, with some input in English. It is also going to cross over with History topics this term, as both classes are studying World War One and this will be the inspiration for our opera. The younger children will learn songs from the war which will also be added to our final work. Class 6 will take on the main roles as leaders and designers and as the year progresses some of this will take place in Art lessons and possibly during clubs. Once we have a skelton of our work, a member of the Royal Opera House team will come and spend some time with us to make sure we are on the right track. I am sure many of you are wondering how you can get involved (or perhaps I’m just hoping to twist some arms.) At the moment, the main area of support is in enthusiasm and supplying odds and ends of fabric, magazines, papers etc which we can use for mood board collages. Old torches would also be useful for experimenting with lighting. As the year goes on, we will be keen to enlist help in other ways, for example helping to make or source costumes, paint or build props or sets etc. I will keep you updated on a regular basis. I am certainly looking forward to a very exciting project, as are Class 6 who are very keen to take control of the whole process. They are already creating a celebrity invitation list! Here’s to The Grantham Prep. Opera 2015.